As Bayfront Park in downtown Miami gets ready to host the annual Mercedes-Benz Corporate Run, drivers can expect lots of road closures. The 5K run is slated to begin at 6:45 p.m. at 301 Biscayne Boulevard, and it's expected to draw more than 27,000 walkers and runners for what's being called Florida's largest office party. More than 850 companies are participating. Biscayne Blvd. northbound lanes from Chopin Plaza to NE 5th St will be closed approximately 2PM to 11PM. All North bound traffic will be re-routed to the south bound lanes of Biscayne Blvd. at Chopin Plaza. Biscayne Blvd. from Chopin plaza south to Biscayne Blvd Way will be closed approximately 6:45PM to 7:15PM. Biscayne Blvd. Way from Biscayne Blvd to SE 3rd St. will be closed approximately 6:45PM to 7:20PM. SE 3rd Ave. from Biscayne Blvd. Way to SE 2nd St. will be closed approximately 6:45PM to 7:30PM. SE 2nd St. from SE 3rd Ave. to North River Drive will be closed approximately 6:45PM to 7:40PM. North River Drive from SW 2nd St. to NW 5th St. will be closed approximately 6:45PM to 7:50PM. NW 5th St. from North River Drive to NW 3rd Ct. will be closed approximately 6:45PM to 8:00PM. NW 3rd Ct. from NW 5th St. to NW 3rd St. will be closed approximately 6:45PM to 8:10PM. NW 3rd St. from NW 3rd Ct. to North Miami Ave. will be closed approximately 6:45PM to 8:20M. North Miami Ave. from NW 3rd St. to NE 2nd St. will be closed from approximately 6:45PM to 8:30PM. NE 2nd St. from North Miami Ave. to NE 2nd Ave. will be closed from approximately 6:45PM to 8:40 PM. NE 2nd Ave. from NE 2nd St. to NE 4th St. will be closed from approximately 6:45PM to 8:50PM. NE 4th St. from NE 2nd Ave. to Biscayne Blvd northbound lanes will be closed approximately 6:45PM to 9:00PM. 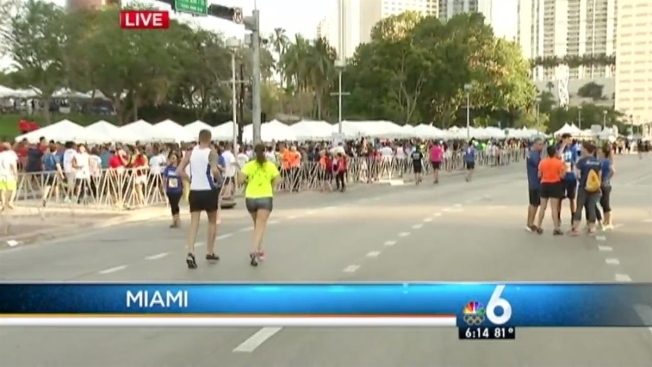 As Bayfront Park in downtown Miami gets ready to host the annual Mercedes-Benz Corporate Run, drivers can expect lots of road closures. NBC 6's Stephanie Bertini reports. If you're lucky enough to be north of Northeast Fourth Street west of the Miami River or south of Biscayne Boulevard, not to worry! You won't be affected by the road closures. For more information, visit Mercedez-Benz Corporate Run on the web.